for this Drug Inspector TNPSC Recruitment 2019 is www.tnpscexams.in. 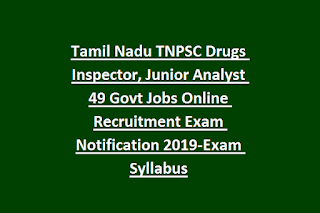 In this notification we are also attaching the syllabus pdf for this TNPSC Jr Analyst, Drug Inspector jobs. Detailed information about this TNPSC Drugs Inspector vacancy details, qualification, age limits, exam pattern and syllabus and other details are updated below. 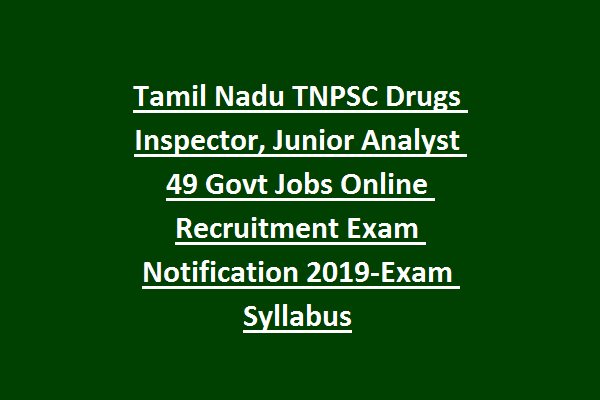 There are total 49 posts in this TNPSC Drugs Inspector jobs recruitment 2019. For General candidates age limits are 18-30 years and for SC/ST,BC/OBC/MBC there is no age limit. Written exam and interview/oral test will be conducted for candidates selection. Apply online for this Tamil Nadu PSC Recruitment of Junior Analyst and Drug Inspector vacancies. Last date to apply online for these vacancies is 12-05-2019. Official website to apply online is www.tnpscexams.in. Hall Ticket for this TNPSC vacancies will be released 10 days before the exam date.